In Healing Waters—the first study in the new Faith and Fiction Bible study series—popular Christian fiction author Melody Carlson draws upon her novels in The Inn at Shining Waters trilogy to invite women on an exciting journey toward healing. 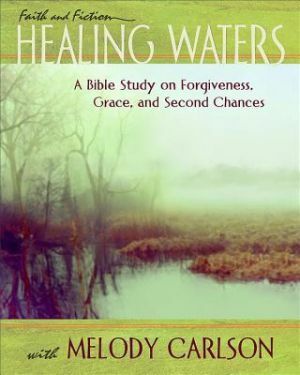 Using the stories, themes, and characters of the novels as a backdrop, this eight-week study explores the need for forgiveness and mercy in one's life and the role that second chances and new beginnings play in healing women's spirits and relationships. The Participant Book is an all-inclusive guide providing summaries of the three novels—River’s Song, River’s Call, and River’s End—character sketches of the main characters, excerpts from the novels, and five daily Bible study readings for each week. Each day’s reading includes reflection questions with space for recording responses, a short prayer, and an “As You Go” idea or suggestion. Although reading the novels is not required to participate in the study, women may choose to read the novels in tandem with the study to enrich the overall experience. Ever wonder what Jesus might say to you if you met him on the street? Chances are his message to you wouldn't be all that different from what it was two thousand years ago, even though you live in a totally different world. You can discover what he said—and what it means for you every day—by reading his words found in the Bible. If you want to grow in your faith and understand who Jesus really is, Devotions for Real Life can help. 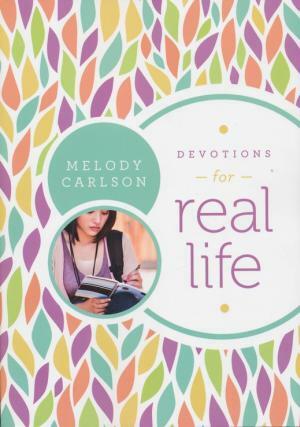 Each short daily devotion from bestselling author Melody Carlson helps you read Jesus's words for yourself. Then Melody unpacks and applies his words to all of your life—school, family, relationships, and more. Devotions for Real Life gives you words you can depend on through all the ups and downs and runarounds of your world. Raising a teen daughter can be like trying to chart a course underwater. You can drown in an ocean of one-word answers, defensive conversations, and unpredictable outbursts..and never get anywhere. This book helps you cut through murky, deep, uncharted and seemingly unsafe waters so you can hear what your daughter is really trying to tell you. Instead of focusing on outward behaviors, Dear Mom captures your daughter's heart and soul. You can know her hopes and fears, her doubts and dreams about her identity, guys, friendships and even you. And you can connect with your daughter on a deeper, more intimate level that will carry both of you through the stormy seas of life. Melody Carson, Heather Kopp, and Linda Clare. For mothers who refuse to give up on their sons–and those afraid they already have. It seems like just yesterday your son was a precious little boy who loved to give you kisses. Today, he often ignores your advice, brushes away hugs, and sees you as the enemy. Though you hate to admit it, he seems to have lost his spiritual and moral compass. And the more "lost" he becomes, the more lost you feel. 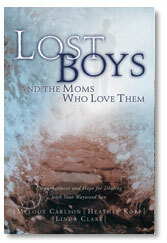 From spiritual solace to practical wisdom, Lost Boys and the Moms Who Love Them offers a broad range of welcome insights from women who understand your heartache as only mothers of troubled sons can. "This book touched my heart and I am not even a mother! The stories are compelling, encouraging, and hope instilling. If you are a mother with a son who is causing problems for himself, you, or your family, you will want to read this book. It is easy to read with many short stories that can be read in the few precious moments that a mother has every once and a while." In this fast-paced world of hustle and bustle, the small, simple pleasures of life are often drowned in a sea of expectations and responsibilities. Often we miss the brief reminders all around us of God's love and faithfulness to us, not because we do not need them but because we don't take time to look. I've written this book to encourage the reader to "take time" to breathe deeply, touch a baby's cheek, listen to an elderly person, forgive an old hurt, or hug someone spontaneously. A simple message coupled with a beautiful design reflecting the comforting truth we often do not take time to notice.